People go to train stations to travel somewhere or to meet a traveller. 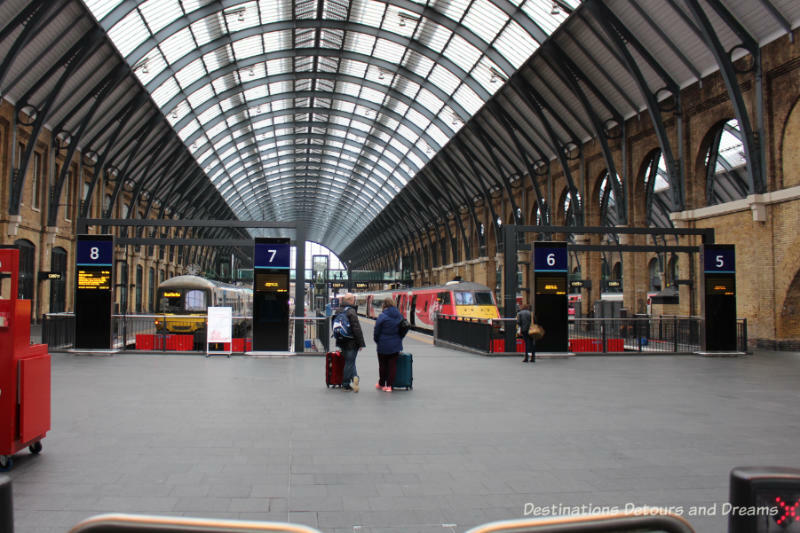 Train stations aren’t typically destinations on their own, but there is something at London’s King’s Cross Station that is attracting crowds. 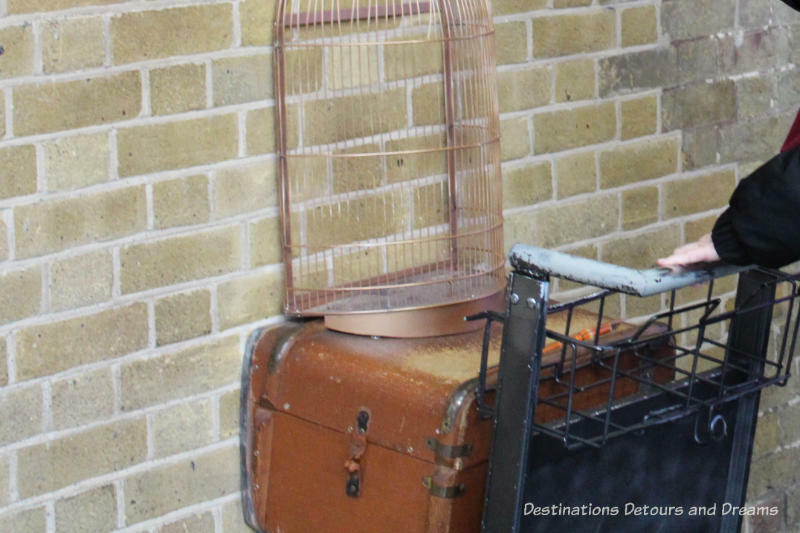 Harry Potter fans know fictional platform 9 ¾ as the place where one departs for Hogwarts School via the Hogwarts Express. 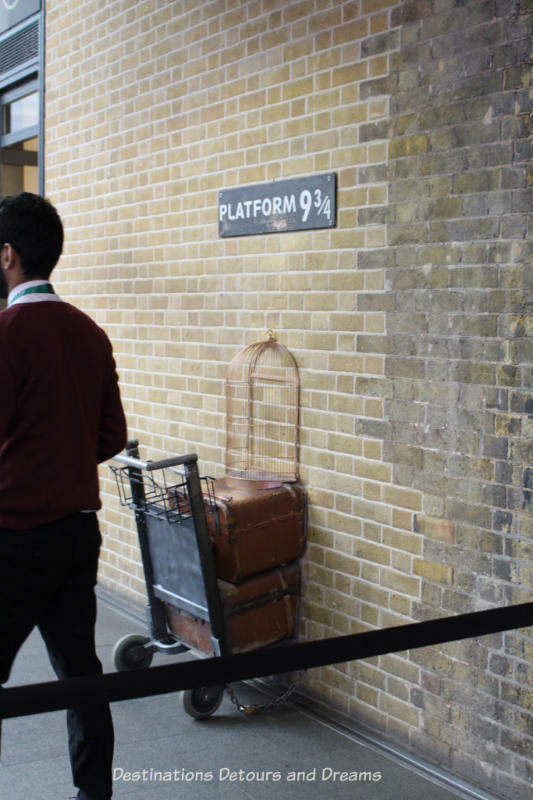 The historic real-life King’s Cross Station has created a “platform” for Harry Potter fans. 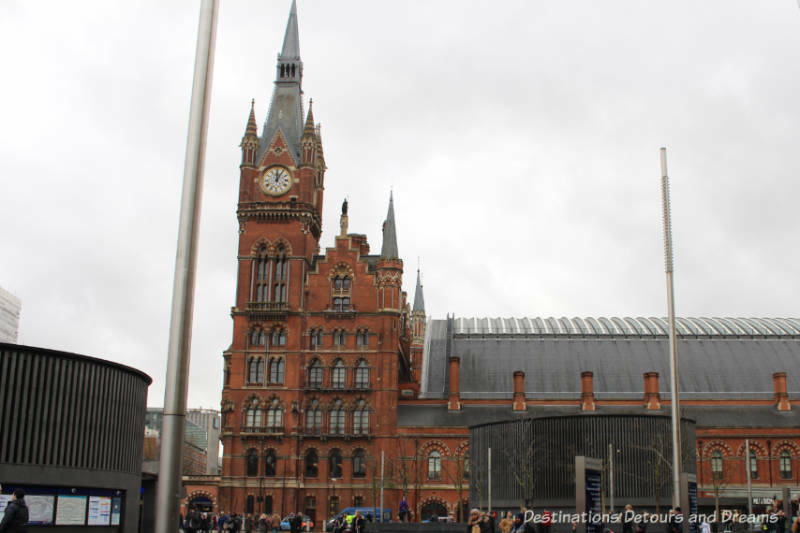 Both King’s Cross Station and neighbouring St. Pancras Station are worth a look around beyond the fictional platform. It seems odd that two stations exist so close together. They were built by separate companies in the days of a railroad boom in Britain. Concern about train tracks criss-crossing through central London resulted in a ruling that no train station could lay tracks south of Euston Road. Both stations are just north of Euston Road. 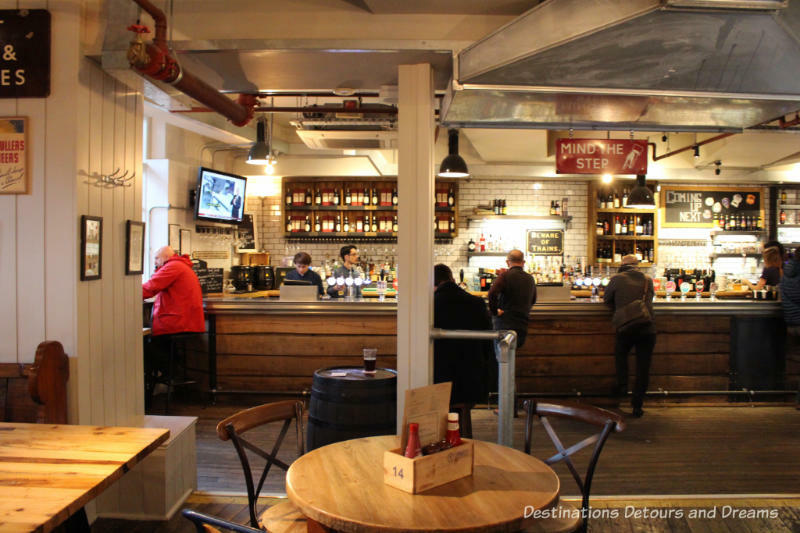 (A third station, Euston Station, is only a few blocks away.) 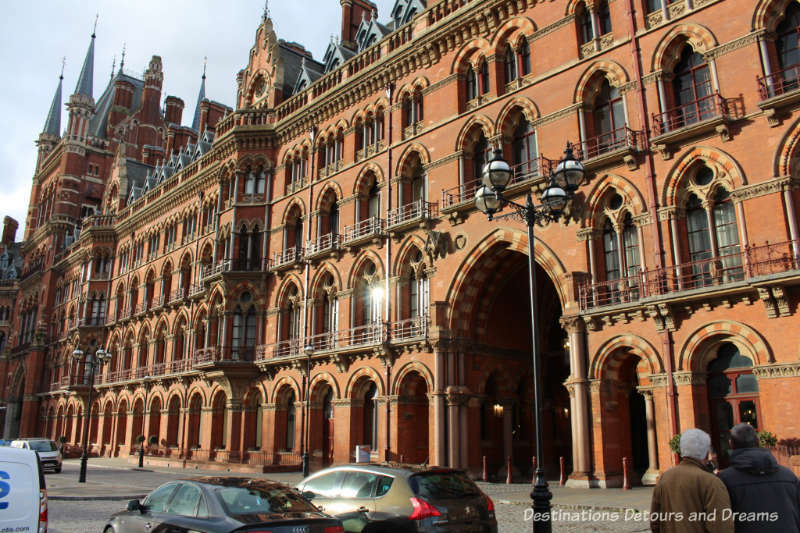 Today, King’s Cross and St. Pancras remain active transportation hubs. Both are historic Grade I listed buildings. 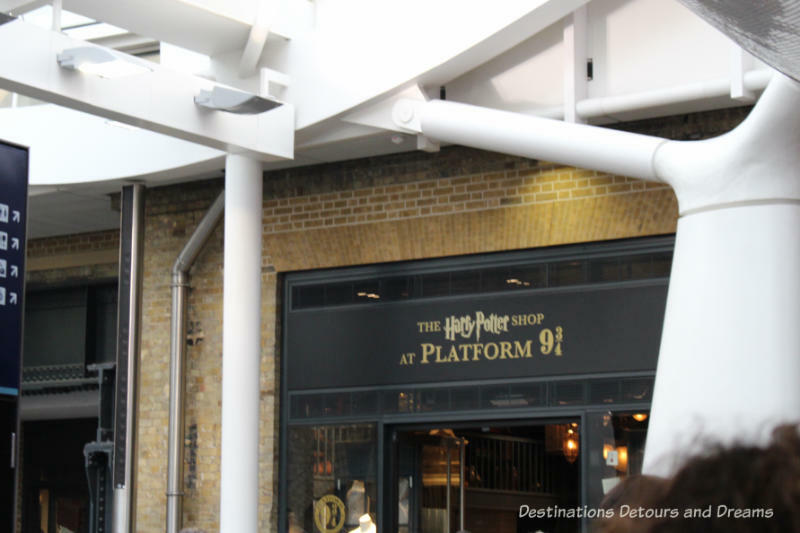 In Harry Potter’s wizarding world, Harry and his friends get to the platform by dashing through a brick wall between platforms 9 and 10. In the real King’s Cross Station, railway tracks separate those platforms. But there is a Platform 9 ¾ on a wall in the station concourse. 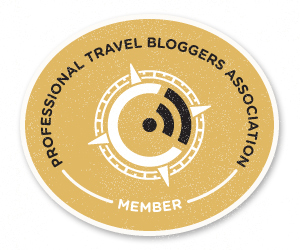 Look for a luggage trolley embedded in the wall. I asked at the information booth where to find the “platform”, but I needn’t have. I just needed to look for the crowd. 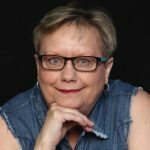 A professional photographer is on hand daily between 9 am and 9 pm to take photos of visitors beginning their imaginary journey. There was a queue when I was there. I suspect that is the case most of the time. There was a limit to the number of people who could fit within the rope cordons of the queue. The rest lined up outside one of the station doors so as not to block access for real passengers. As the line moved, groups of about a dozen people at a time were allowed into the queue within the station. The line moved quickly and efficiently. Before posing for photographs, people chose a scarf from one of Hogwarts’ houses. A member of the photography team helped people pose in the best position for the shot and then waved the scarf to give a movement effect just as the photographer snapped the shutter. It all happened within about a minute. The line exited via the Harry Potter Shop, where the photos (along with a lot of other merchandise) were available for purchase. You can go through the line without committing yourself to buying the photo. Friends can snap your picture for free. (But they need to be quick to catch the blowing scarf.) Of course, if you visit outside the hours when the professional photographer is there you will need to take your own photos. 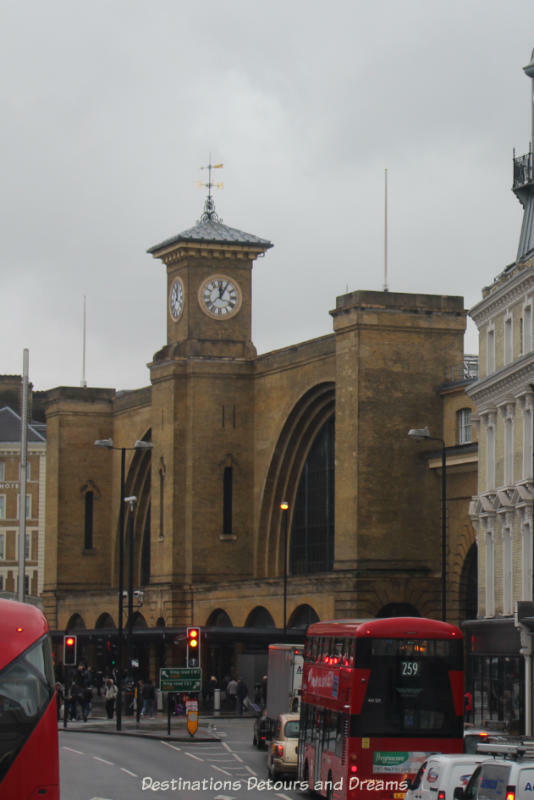 King’s Cross Station was built as the London hub for the Great Northern Railway. Designed to be simple and functional, the station opened in 1852. The station roof, the largest at its time, was supposedly modelled on the riding school of the Czars of Moscow. Regent’s Canal is less than a mile north of the station. Gasworks Tunnel was built under the canal and trains passed under the canal. Today King’s Cross Station is the main terminus of the East Coast Main Line connecting London with the north-east of England and Scotland. The station retains its original Victorian facade, but it is modern inside and has been added to. The western concourse, where you find platform 9 ¾, opened in 2012. The wall 9 ¾ rests upon was once an exterior wall. At one end of the concourse is a large pub and restaurant. 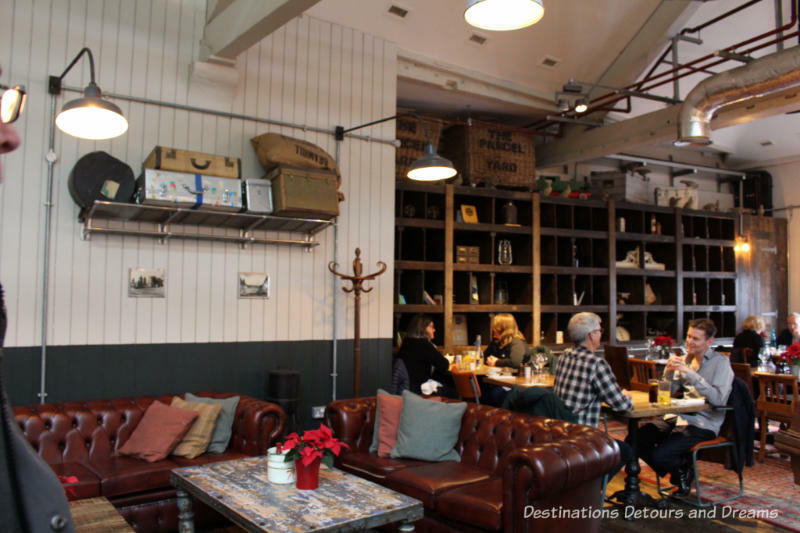 The Parcel Yard is located in what was once the Great Northern Railway parcel office. The pub covers two floors. Its many rooms and nooks and crannies contain memorabilia from its parcel-sorting days. St Pancras Station is located across Pancras Road from King’s Cross Station. Built by the Midland Railway to connect London with the east Midlands and Yorkshire, it opened in 1868. Along with the former Midlands Hotel, the talk of London when it opened in 1876, it is considered a masterpiece of Victorian Gothic architecture. It had the largest single spanned roof in the world when it was built. 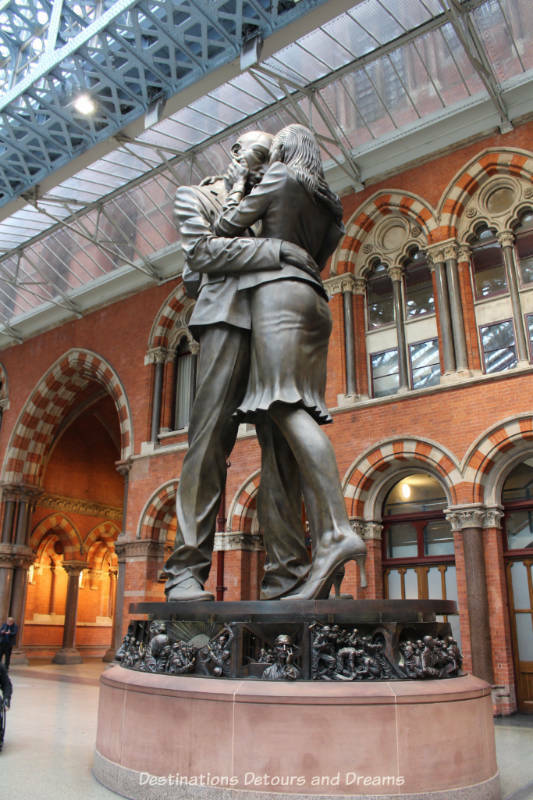 Today it is London’s gateway to the rest of Europe with Eurostar service to Paris and Brussels. Trains also run to southern England and to Derby and Leicester in the East Midlands. Instead of building a tunnel under Regent’s Canal as was done for trains to King’s Cross, platforms were raised on a grid of 688 cast-iron columns to allow steam engines to pass over Regent’s Canal. The space underneath was used to store beer produced by Burton Brewers. The columns remain in the lower level, although beer is no longer stored there. During a renewal of the station in 2004 to 2007, lightwells were inserted in the platform to let light into the lower area and allow access. The area, now called the Arcade, is home to a number of shops and platforms for Thameslink trains. 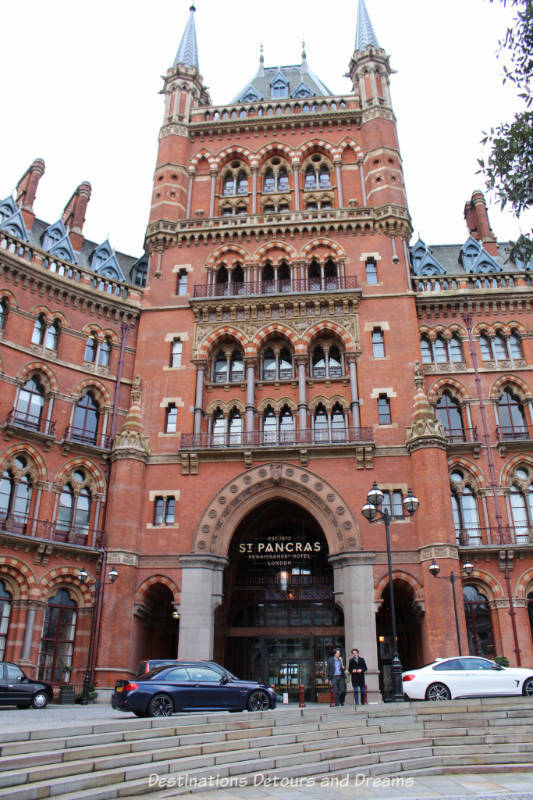 St Pancras Renaissance London Hotel occupies parts of the original Midland Grand Hotel. Midland Grand Hotel closed in 1935 and was used as office space for London Midland & Scottish Company, the company which took control of Midland Railway in 1921. That company became part of British Rail in 1948. 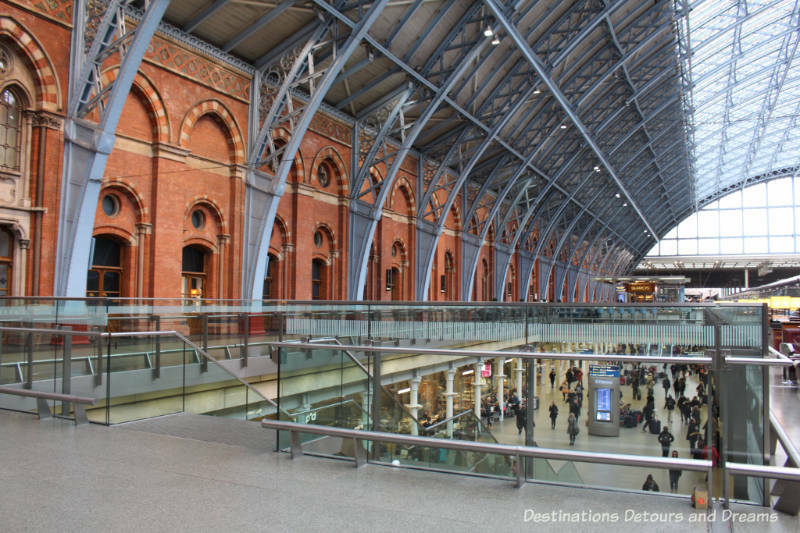 In 1966, British Rail put forward proposals to close both King’s Cross and St Pancras Stations, but public response led to the station being listed as a Grade I historic building. The office space in the former Midlands Hotel was vacated in 1985 when it was declared unsafe. Renewal of the station occurred in 2004 to 2007 and the new hotel opened in 2011. Let’s hope nobody hurts themself trying to pass through that brick wall at platform 9-3/4. I trust that wand in your hand got you through. Ken, the wand helped (in my imagination anyway). I love train stations and travelling by train. What a gorgeous hotel! Deb, it is a beautiful hotel. I think it would be an interesting place to stay. I can remember when Kings Cross station was dark and dingy, and you couldn’t see the architectural features on St Pancras because it was all covered with dirt from the smogs of the 1950s! Both stations have been transformed beyond recognition and I always enjoy visiting them now. Karen, I’m glad they’ve been transformed. They are so beautiful now. OMG. 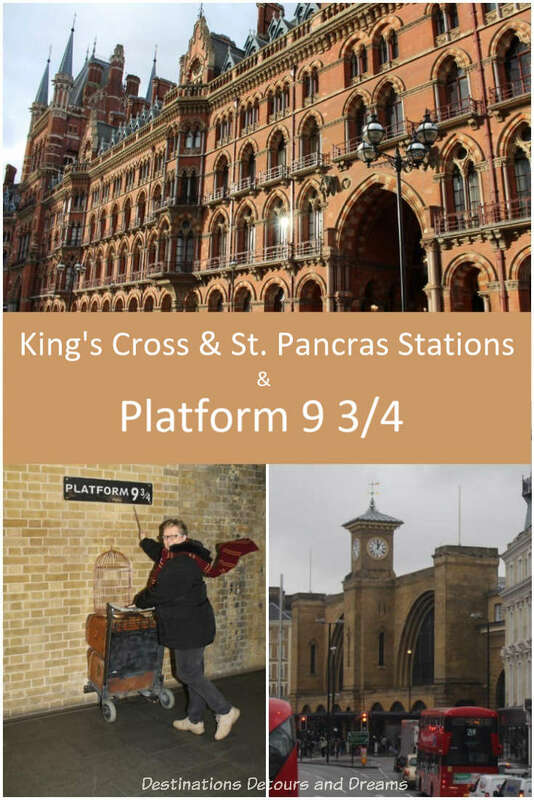 Here I am, having used both stations several times when my daughter was assigned in London and didn’t even know about Platform 9 3/4 or the other historical parts. I should spank myself for always zeroing in on traditional tourist spots! 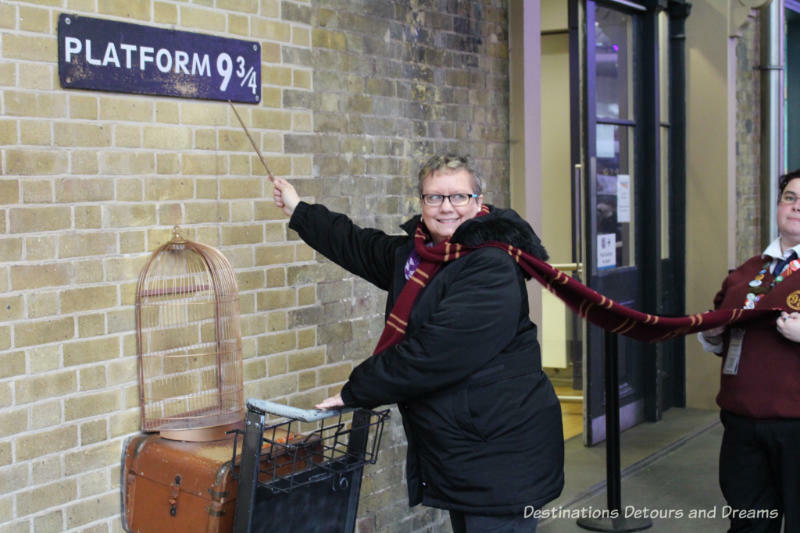 Carol, we stopped here specifically to see Platform 9 3/4. I’d read about it. My husband and I were on an outing with his friend that included a visit to the place they’d shared a flat 49 years before. It wasn’t too far from King’s Cross so I suggested a detour. Our friend, a born Londoner who loves his city, made sure we saw the rest of the stations and knew some of the history. 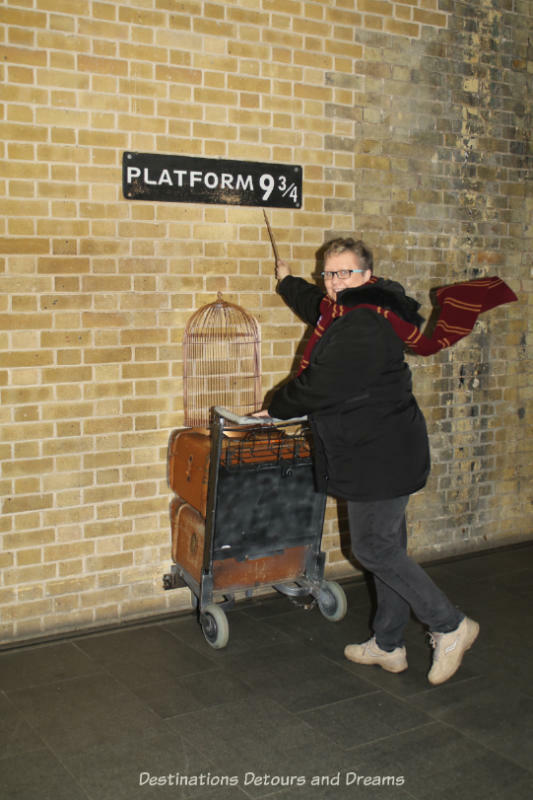 Some years ago, I took a Harry Potter tour of London, which included Platform 9 3/4, of course. There was no queue or photographer or shop at the time, so we had it to ourselves. 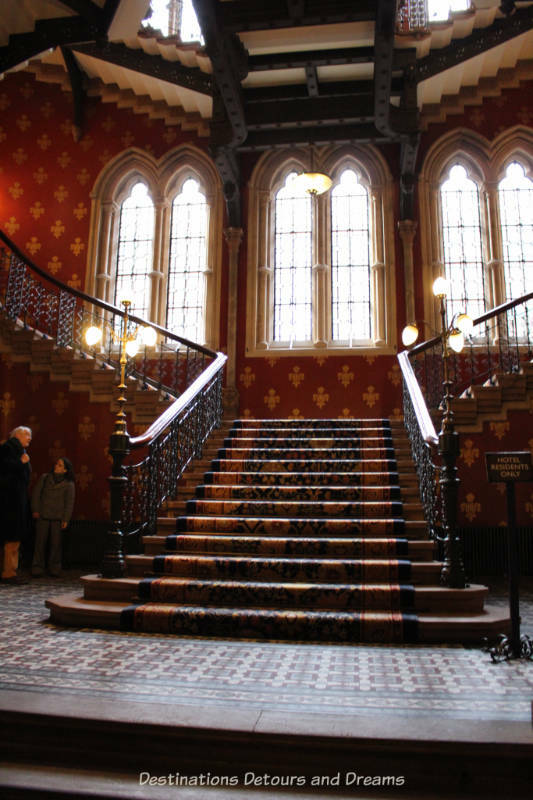 The tour guide also took us inside — I think it was St. Pancras, not Kings Cross — to see the platform that was used for filming the platform scenes. He also took us to other spots where bits of the films were made, like where the storefront is that was the entrance to Diagon Alley. Great fun! Rachel, that tour sounds like so much fun. HI Donna. I admit to not being a Harry Potter fan. Not because I don’t like the series. But because I live with someone who doesn’t aporeciate fantasy or science fiction at all. Pretty hard for someone who was always a Star Trek fan! But I love the fact that they’ve built a subculture around the Harry Potter plot. Fun! Doreen, it is a nice bit of fun. 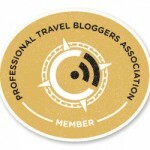 I’m out of the Harry Potter loop, but can always appreciate a blog about train stations. I love traveling by train and the uniqueness and often grand beauty of the stations always surprises me–even when I’m expecting it! 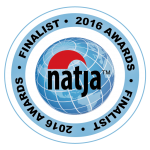 These stations are lovely and it’s great that they are classified and safe. RoseMary, these stations do evoke a sense of the grandeur of train travel. Platform 9 and 3/4 is a fun addition when you’re not clock watching to then catch your train haha!! Linda, St Pancras does just scream at you. I love the architecture. Loved the tour of these train stations. I think it was Kings Cross I left for Scotland from many years ago. What a glorious trip! These train stations are lovely. 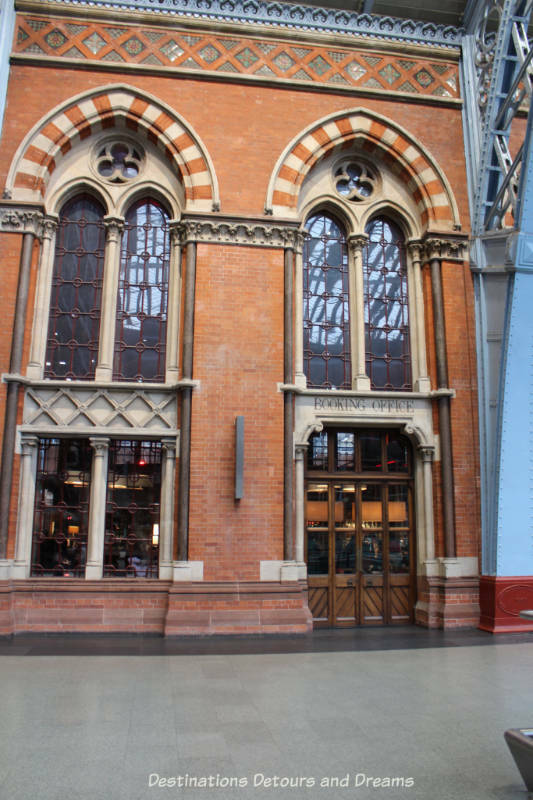 St. Pancras is one of the world’s most beautiful train stations, and I’ve seen a lot of them. I just love pretty much everything about London, though. The stations are just a bonus. Tom, I too love pretty much everything about London. I’m always excited when I get a chance to return.